Welcome back SIFF 2014. After a less-participated event last year, let's hope this year will be merrier. 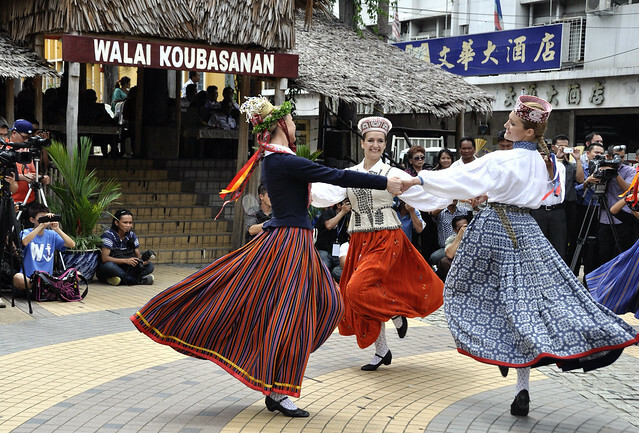 Throughout the second week of June, culture vultures will be enthralled by the colours, rhythms and diversity of the world's folk dances right here in Kota Kinabalu. The 9th Sabah international Folklore Festival (SIFF) is an annual effort to promote peace and understanding through cultural understanding as dance troupes from around the world gather in the Land Below the Wind to showcase their unique folk dances. The festival begins with a scheduled Sabah International Folklore Festival Parade at Lintasan Deasoka in Gaya Street on 9 June 2014, from 2.00pm to 5.00pm (barring last minute change). I was at such parade in 2012 and believe me, it's mesmerising. The premier show takes place on 12 June at the Tun Raffae Auditorium, Menara Tun Mustapha at 7.00pm. The highlight of the festival is none other than the International Folk Dance Competition on 13 and 14 June, where participating dance troupes will compete for the title of champion. The competition takes place at the Tun Raffae Auditorium. International Folk Dance competition will be on 13th and 14th June 2014. You can also refer to the tentative programme schedule here. Kindly note that the competition venue has been changed from Sabah Cultural Centre Penampang to the Tun Raffae Auditorium at Menara Tun Mustapha in Likas. Winning performance by the Chinese dance troupe in 2012. They did not take part last year. TheGreenMechanics: It's about time you change your mindset about watching cultural performance - be willing to pay. We did not go to the SIFF last year but did the previous year when it was won by the China dance troupe. We plan to come back to enjoy the performances this time around. How was the festival this time, bro? Went around and took lots of pictures ka? hehe.